Have you ever noticed that homemade Indian food is “lighter” than the versions that you find in restaurants? There’s a reason for that – mostly because restaurants, by and large, tend to use more ghee, coconut milk, sour cream and cream than their home cook counterparts. Thus, even a humble dish like aloo gobi (potato and cauliflower curry) has a leaden, stodgy quality that instantly reminds me of soggy potato-flavored cardboard. If I eat enough of it, I’ll want to take a five-hour nap immediately afterwards. One of my food resolutions for 2012 is to cook Indian food more often, while using seasonal ingredients. I also want to explore more interesting vegetarian options, which means going beyond the usual vegetable-based standbys that people are familiar with. You know, dishes like baingan bharta (roasted eggplant in a tomato-based sauce), palak paneer (creamed spiced spinach or mustard greens with cubes of paneer cheese), aloo mattar (potato and peas curry) and chana masala (chickpea curry, usually paired with spinach). Don’t get me wrong; when made well, each of these are delicious and beloved. I especially adore long-simmered lentils such as masoor dal or urad dal, with rice, chutney and green mango pickle; it’s Indian comfort food at its simplest. I just want to broaden my horizons a little bit, and in the process, maybe teach myself something new. Adapted from this recipe, which cites the August 2011 issue of Taste Magazine as the original source. The recipe presented below is my version. Most of the spices are available from Penzey’s or at a specialty food shop in your city. Paneer is simply homemade cottage cheese in solid form and is available at Indian specialty food shops such as Kalustyan’s. Persian raisins are green in color and have a sweeter taste than golden sultana raisins; they are also available from Kalustyan’s. Substitute sultana raisins if Persian raisins are unavailable. Instead of paneer cheese and ghee, you can substitute tofu and vegetable oil respectively if you prefer the vegan version of this recipe. Cut paneer into cubes and pat dry on paper towels. Heat 1/4 cup oil in a large skillet over medium heat. When the oil is hot but not smoking, add the paneer. It will spit, so be prepared for that. Brown quickly on both sides, flipping it with two forks. Cook for no more than 2 to 3 minutes or it will start to collapse. Transfer the paneer to a plate lined with paper towels. Drain the skillet of the oil. Melt 2 tablespoons ghee in the same skillet (if using vegetable oil, gently warm the oil) over medium heat and add the black mustard seeds. Toast the seeds until they ‘pop’. Add the onion, jalapeño pepper, ginger, cumin, turmeric, salt and dried curry leaves and cook gently for about 5 minutes, or until onions have become translucent. If the onions begin to brown, either the heat is too high or you’ve cooked them for too long. Add the raisins and tomatoes and fry for 3 to 5 minutes, until tomatoes are just starting to collapse (don’t let them turn into a purée). 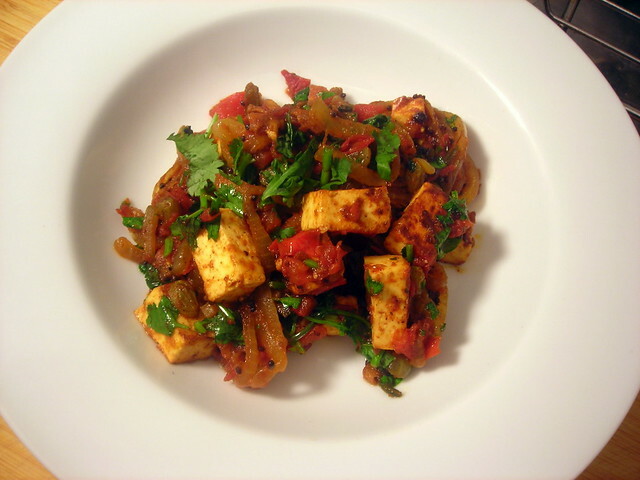 Return the paneer to the pan and gently fold into the tomato mixture. Cook until the paneer has been warmed through, about 2 minutes. Taste for salt, stir in some chopped cilantro, then remove from heat and serve immediately. 05 Jun	This entry was published on June 5, 2012 at 4:35 pm. It’s filed under cooking, food, food photography, Gluten-Free, Indian food, recipe, summer, vegan, vegetarian and tagged appetizer, dinner, food photography, gluten-free, Indian food, raisins, summer, tomatoes, vegan, vegetarian. Bookmark the permalink. Follow any comments here with the RSS feed for this post. This sounds delicious. I’m going to try making some of my own cheeses this summer, and paneer is on the list. I’ll definitely have to make this recipe. Thanks for stopping by and for the comment, and please let me know how it turns out.